Based in Hong Kong since 1983, when he worked on the Hong Kong and Shanghai Bank headquarters with Norman Foster, Griffiths has built up an empire of offices across Asia, with bases in 13 cities, from Shanghai and Singapore to New Delhi and Dubai. Last week Aedas announced a demerger from its European offices, where the scale of work was on a “different trajectory” (i.e. too small), but it has already set up a new base in London with the aim of importing its high-octane brand of gigantic Asian projects to Europe. The company has come to specialise, Griffiths says, in a particular kind of urban development that has grown out of these fast-paced emergent economies. It is a design philosophy that conceives chunks of cities like self-contained ocean liners: clusters of high rise buildings that are “glued together” at their bases on podiums that brim with retail and leisure, usually perched on top of major transport nodes. 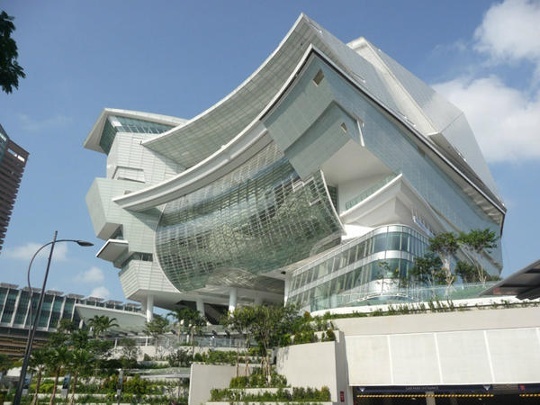 It is a form of mall urbanism that is now ubiquitous across Asia, as urban street patterns are trampled beneath galumphing glass behemoths. The city’s ground level is surrendered to cars, while pedestrians scuttle between air-conditioned retail hubs overhead. They are self-contained commercial ecosystems, built and managed by single private interests, on a scale that makes London’s biggest developments look like tiny specks on the planner’s map. Such projects, says Griffiths, are usually between 465–930,000 sq metres (5-10m sq ft) in China. Westfield Stratford City, London’s Olympic shopping Mecca whose developers claim is Europe’s largest such complex, is just 177,000 sq metres (1.9m sq ft). 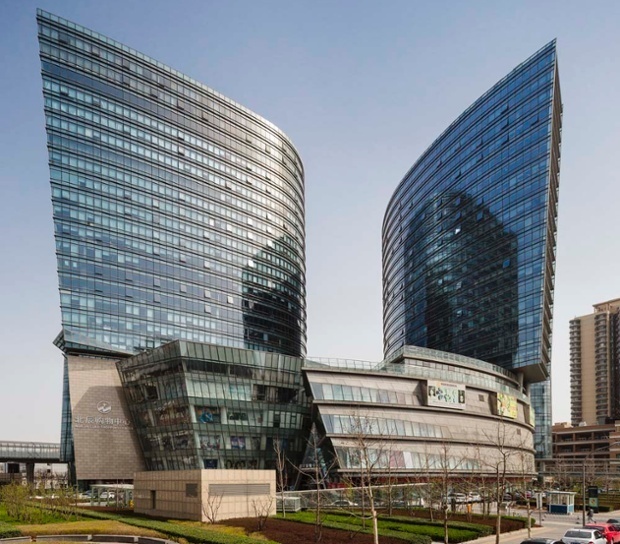 On the edge of Beijing’s Olympic site, Aedas has completed the North Star mixed-use development, comprising a six-storey podium of swooping shopping arcades, from which 100m-tall towers rise into the smoggy skies. It is built on a plot measuring 200m x 200m, which the company’s design director, Andrew Bromberg, describes as an “extremely small site”. By no means the worst of its kind, it is one of many such generic developments that are increasingly defining the nature of the Chinese capital: hermetic indoor worlds sprouting above stations, with little connection to the life of the street outside – because the street is usually a six-lane motorway. The six-storey North Star development in Beijing. He flicks through more slides of wide-angle photos and dazzling renderings, showing floor plates stretched into ever more unlikely shapes and cladding systems wrenched around twisted lumps, as different global cities merge into one free-form soup of contorted mirror glass. 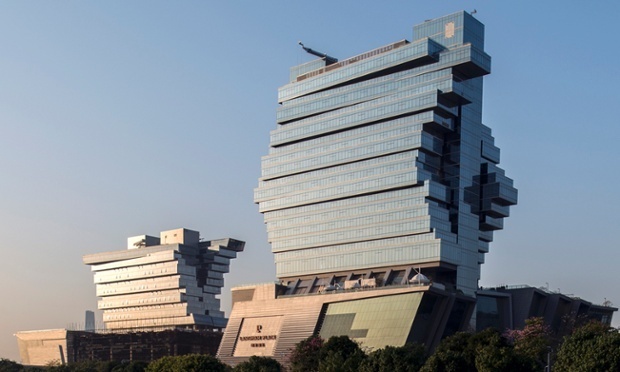 There is Centre 66 in Wuxi, a 372,000 sq metre (4m sq ft) complex of shops and office towers clustered around a Ming dynasty hall, and renderings for Xihongmen in Beijing, a 465,000 sq metre (5m sq ft) development on the Fifth Ring road, shaped like a troupe of streamlined golden tanks ready to charge at the city. Each sculpted carapace contains interiors of sparkling shopfronts arranged around swirling atria, visions of economic growth and prosperity, unperturbed by the fact that the country’s largest mall still stands empty almost a decade after it was completed. Such inward-looking buildings, which often span several city blocks, may be “contextual” to the new cities of China in some architects’ eyes, but how such ambitions translate to London remains questionable, where news of 230 new towers planned across the city has renewed scrutiny of the skyline. China’s biggest developers – from Greenland and Vanke, to Dalian Wanda and ABP – are already flocking to the capital in response to demand from the country’s burgeoning billionaire class, looking to park their money overseas. Last year ABP signed a £1bn deal to transform the Royal Docks into an Asian business district, while Greenland bought Wandsworth’s Ram Brewery, slated for a 36-storey tower, and a site in Canary Wharf, where it plans the tallest residential building in Europe. In 2013 the Chinese were granted the most tier-one investor visas for the UK (which fast-tracks the immigration process for those investing more than £1m in the country), overtaking Russia for the first time. In 2003 there were no dollar billionaires in China; this year, the Hurun Global Rich List recorded 358. With the slowdown in the Chinese economy and the strength of the renminbi versus the pound, London is an increasingly attractive proposition – and practices like Aedas are only too ready to provide the same services their clients are used to back home. But at what cost to the city? It might sound like a vision from Blade Runner, but it is a proposition that dates back more than half a century, to a grand plan for a future London connected by elevated walkways. In 1947, in a wave of postwar optimism, Charles Holden and William Holford developed a plan for a network of routes at first-floor level that would connect buildings across the City. Most extensively completed around the Barbican estate, the Pedway scheme was abandoned by the 1980s, incomplete and partially demolished, as the tide turned against the idea of separating pedestrians from the streets below. (Its history is loving documented in the film Elevating London). The same happened in many US cities that had adopted elevated skywalks, from Milwaukee to Minneapolis to Cincinnati, where raised walkways resulted in empty pavements and deserted downtowns, forming cities that were physically separated by economic class, socially stratified in concrete and steel. As London’s increasingly international development market brings not only overseas investment, but the physical realities of urban forms spawned in the high-speed laboratories of Asia’s developing cities, the skyline debate might end up being the least of our worries. The next frontier will be a wave of ground-scraping mega-buildings looking to gobble up our streets, making an ever more privatised, polarised city, all conveniently swept indoors.